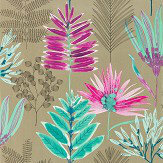 Esta Home are a Dutch design company bringing fresh, bold designs for wallpapers to the UK. From their Netherlands based studio, Esta Home produce a wide range of adaptable wallpaper designs that would suit any interior space. A bold wallpaper featuring large scale cheese plant leaves. Shown here in the lagoon / cerise colourway. Wide width. Please request sample for true colour match. A lustre effect wallpaper featuring a variety of beautiful illustrated plant leaves. Shown here in the lagoon / zest colourway. Other colourways are available. Wide width. Please request sample for true colour match. 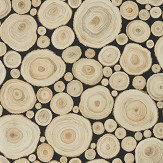 An unusually patterned wallpaper featuring varying sized log ends. Shown here with cut logs on a lacquer black background. Other colours available. Please request a sample for true colour match. A wide width and paste the wall product. 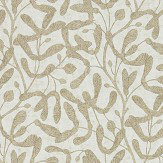 A matt finish all over patterned wallpaper featuring sycamore seed pods. Shown here in gold. Other colours available. Please request a sample for true colour match. 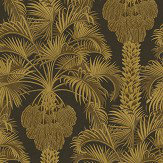 This decadent wallpaper featuring an all over palm tree design takes its inspiration from Dutch artist M.C. Escher's famous tessellation prints. 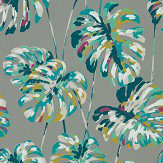 Printed in metallic inks this will surely bring a touch of glamour to any interior. Shown here in the charcoal / gold colourway. Other colourways are available. Please request a sample for a true colour match.